Ordering a beautiful house-plant or succulent arrangement is easy at Petal Passion. Just let us know what you are looking for. It is helpful to know in what type of micro climate the plant will end up. For most plants we need about 24 hour notice before pick up or delivery although we have some plants in stock. We can choose a single large house plant for you or an arrangement of smaller plants with similar needs. With a little bit of care, plants make a long lasting token of your regards. Succulents especially are a very popular gift and easy to take care of in a sunny location, I usually keep plenty in stock. I also stock a few ferns for a much more shaded place, as well as several other types of plants. Also, I often visit the Portland Flower Market on Swan Island, where I can find many more varieties that might just be the gift that you are looking for. SO don’t hesitate to give me a call (#503 453 0912) to find out what’s in store or send me an email, I usually check my emails twice a day or so. Spider-plant in blue ceramic pot. Regrettably too many beautiful pots have bit the dust in the past and at times I have found it hard to throw out the pieces, as it was such a lovely pot! The broken shards were piling up and threatened to overtake the potting shed so I finally started using these pieces of broken treasures to create a new vessel, I fill it with plants and offer it for sale at the Petal Passion studio or at The Bamboo Craftsman in nearby Kenton. Note: These creations usually take a few days to put together. 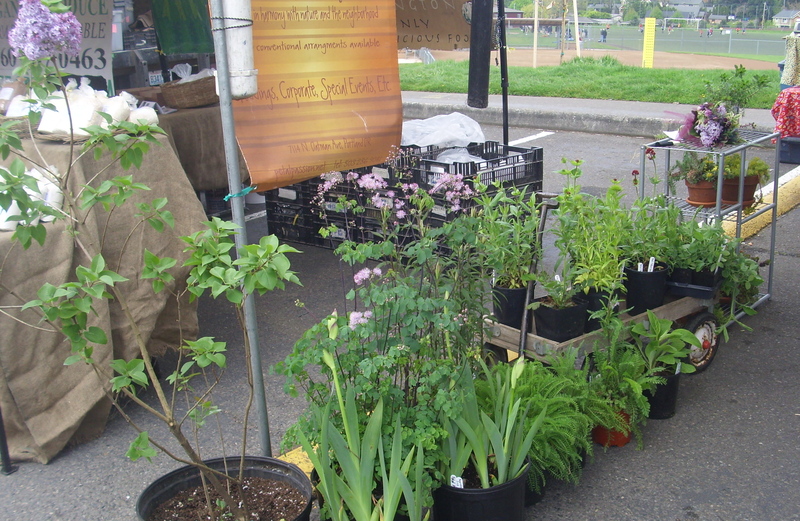 Garden Plants are sometimes available for purchase. With so many perennials to take care of, we often divide plant, bulbs or tubers. Typically during Spring and Fall, so this is an excellent time to come by the studio at 7114 N Oatman Ave in N Portland or call Marianna at #503 453 0912 and find out what has been dug up and offered for sale.